In 2008, Jennifer Smith founded a workshop for Gregorian Chant, at Ealing Abbey Parish of St.Benedict, in West London, W5 2DY, which she ran weekly until 2014. We studied the Chant, its notation, history, its place in the Liturgy of the Church. We participated in Days of Chant at the Abbey, run by the Monastic Musicians, Colin Mawby, and Christopher Hodgkinson, and regularly took part in the Liturgical celebrations in the Parish. Our aim was to help keep alive this wonderful musical and liturgical tradition of the Church, and the only way to do that is.... to do it! The workshop has continued since Jennifer's move to France, and is now run by Dom Peter Burns OSB, same place, same time. 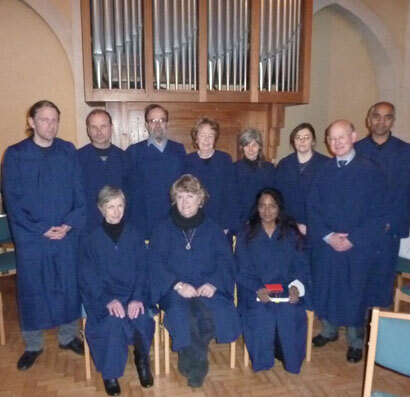 The group is now called the EALING ABBEY LAY PLAINCHANT CHOIR, and is part of the Benedictine Institute.